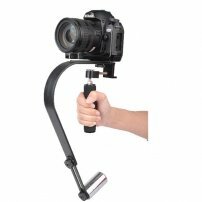 SLR / DSLR Cameras / Phone / iPhone / GoPro Stabilizer / HandGrip w/ CounterWeight & Bubble Level : allputer.com - Accessories for all your Portable Electronics & Computers! The Handheld Video Stabilization System allows shake-free handheld shots, easily and with minimal fatigue. It is designed specifically for lightweight mirrorless cameras, GoPro or compact camcorders up to 2 LBS. Mount your camera and be ready to shoot in just minutes. This Handheld Video Stabilization System lets you achieve professional results for still shots, panning, moving in and out on subjects, and more. Take the step up from hobbyist to professional without the expense. Perfect for outdoor action, long shoots, artistic applications and more. The ball joint gimbal design is optimized for smooth function and ease of use; it effectively isolates the rig from user movement, allowing jiggle-free and jitter-free shooting. Counterweights are adjustable for precise handling and customized performance. Use effectively with one hand without tiring, or use two hands for kinetic situations and max control. - Shoot like a pro with this super-solid, "shake-free" design, it is geat for indie film makers looking to move their films to the next level! Shoot smooth motion shots in tight spaces, on stairs, through crowds, in cars, walking, running skating... etc. - 3 separate counter-weights, for precise adjustments. - Ships in 1 week. - GoPro Adapter and Phone Holder INCLUDED. - Net Weight: 842g approx.